Matting is when a cat’s fur becomes knotted and entwined. Matts can occur when the cat’s undercoat sheds (moults) and gets trapped under the top layer of fur. A build up of dirty fur or oily skin, affecting the condition of the fur, can also result in matting. The fur bunches together if left uncombed. Without proper and regular grooming a cats matting can very quickly become pelted. Most owners concentrate on the top layer of fur, when they brush their cat, leaving the undercoat without attention. This can be the start of matting. A matt or knot can sometimes be teased out with the fingers or gently combed out if held at the root. If a comb can be slid between the matt and skin then it is safe to carefully cut the matt out using the combs teeth as a barrier so as not to cut and hurt the cat. This should not be done on a cat that is moving around. Extreme caution and the cats wellbeing is the number one priority when removing a small knot with scissors or by teasing out with fingers. A pelt is a hardened matt or knotting that is tight against the skin. Pelts are formed when matting starts to join together, over a long period of time over various parts of the body. More loose fur, dirt, debris and even faeces, gets stuck in the already formed pelts making them larger. Pelts cannot be combed out and always need to be shaved. The above photo’s are extreme examples of cat pelts but pelting can be equally bad on the underside of the cat where they are hidden from view. Pelting can occur out of view on the arms pits, chest, tummy, under the chin and the nether regions even when the top coat appears fine. The poor pelted cat above was mentioned in The Daily Mirror recently in December 2016. What would a pelt feel like on a cat? Imagine our hair without being brushed or washed for months. It would start to matt very quickly and, in time, would become a clump all over. This would tighten to our scalp and become very itchy and make us irritable and hot. Imagine this clump over our bodies connecting skin from different areas as the matts become more entwined. The matting from under our arm pits has joined matting on our chest drawing the two bits of skin closer together. It feels way too tight for comfort. We are hot, we itch and sores are gathering under the matting. Without being able to communicate our frustration and misery would we then try to rip the hair off of our bodies in desperation? Some cats do just that!!! Would you be comfortable or would you be suffering? B: They cannot tell us what they are feeling. Well, how do cats maintain their coats in the wild? The majority of wild cats do not have long fur. Also, wild cats have larger tongues with large barbs on them to get out unwanted bits and pieces caught in the fur. Lions groom one another. But, if you go and see a lion’s mane up close (NOT ADVISABLE ;-)) it will be matted in places!! Cat groomers get upset when they see a pelted cat. They know how uncomfortable the cat must have been for a considerable time and yet some cat owners do not seem to think much of it. They ask the groomer to shave their cat and all is good again until the next time it occurs. Why leave your cat to matt in such a way as to cause suffering? We all know how much people love their cats but common sense goes out of the window whenever it comes to grooming. Pelted cats have to have a lion cut which is the removal of most of the hair apart from the head, mane, arms and legs. In the worst cases even the cheeks, arms and legs of a cat need to be shaved. Hair on a long haired cat, after a lion cut, takes between 4-6 months to grow to its natural length. This does not mean that a year should go by before contacting a groomer again. 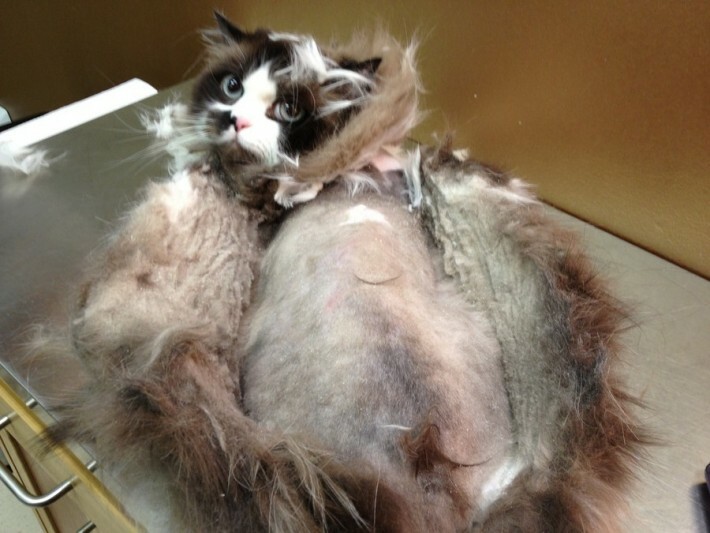 Shaving is the only humane option when a cat is pelted or badly matted but it should not be seen as a quick fix until the cat’s fur ends up in the same condition. It takes time, concentration and skill to shave a cat and, if the cat is aggressive, frightened or elderly, it can be a dangerous * and stressful process. * Cats, especially elderly ones, can die of stress instantly on a grooming table. A groomer knows this and has to weigh up what is best. Elderly cats cannot be sedated. However, they cannot be left pelted either. For the groomer, this situation is highly stressful. These cats are the dread of groomers when their fur is matted. It becomes an extremely stressful long grooming session. Elderly cats are frail, have skin like tissue paper, may hurt when their body is touched, have nails embedded in the paw pads and most of the time arthritic. Imagine the positions a groomer has to negotiate to get to the matts. These cats, as mentioned earlier, cannot be sedated as many have kidney issues. What now? The poor elderly cat has to endure a shaving session and it is never nice when at that age. The groomer is caught between a rock and a hard place and the cat has no choice but to endure, what may seem to them, hell on earth. Why put your cat through such anxiety? Groomers do not want to see a cat matted again and again!! Owners should be combing their cats everyday and checking areas that matt easily such as the armpits, under the chin and around the bum area. Small amounts of combing everyday can make a big difference. A professional groomer should be used every 6-8 weeks to keep your cat’s coat in good condition. It is a cost to be factored in when getting a cat with a high maintenance coat. Think of this cost like we do when getting our hair tidied or cut every few months. If a cat has had a lion cut the groomer can be called in to maintain the fur once it has grown to a length that can be combed. In the meantime the remaining fur still needs attention. If you own a cat whose fur is high maintenance why not ask a groomer for a lesson in how to comb your cat in between regular visits or to check your grooming tools. A joint effort between cat owner and professional groomer will ensure that matting and pelts are a thing of the past. We all want happy cats. Pelts and matting = very unhappy cats. For more information on grooming your cat please contact info@catbehaviourist.com. Further information can also be found on www.catnips.co.uk. I hope ‘seeing matting and pelts from a cat’s perspective’ has helped change yours.